Soon I got the Robot Turtles board game and after some playing decided that it's not fun enough. I want games with action and fierce competition! I asked my kids opinions and they agreed: they want to compete against each other. So I started experimenting for a new game. The idea was that the players commanded tanks by making command sequences out of command cards. The game quickly from a co-operative search-and-destroy game to a competitive race. The players raced each other on a hex board using the command cards (forward, left, right). Each player got to add or remove commands to their command sequence, which was repeated on each turn. So, you could either go fast by accumulating more cards to your sequence, or proceed more carefully. We used game assets from any available board games on my shelf. The game was kind of fun, but was not very well balanced. You could easily drive yourself to a corner and it would take a long time to replace your program with something that will take you back on track. We changed the mechanism of adding/removing cards to a persistent program to one where you had a bunch a cards in your hand and could play any number of cards per turn. Then fill your hand back to 5 cards. That was nice until we discovered that unuseful cards will keep accumulating in your hand, because you play the better ones away. Level design was very hard and the starting turn was too decisive. The hex board also made making full 180 turns quite tedious. Furthermore, the game was a bit dull, because it was quite linear; not many choices to make. 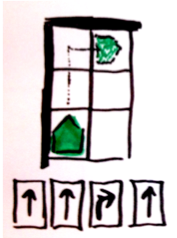 Game design is not easy, I had to admit again. Still, I was convinced that I had a good idea and could make it work by applying my scientist skills. I was indeed keeping a very detailed diary of my observations and insights. But So, after several iterations of changes, including laser guns of course, I decided to try something else. Treasure hunt it was! So instead of racing through a track the objective was now to fetch 3 treasures from the board. This gave the players more alternative ways of winning: there are more than enough treasures on the board. Also, because there are more alternatives, the problem of "bad" cards accumulating to your hand got less irritating. to you. It naturally involved lasers that you could use to remove obstacles. The ideas of stealing treasures from your opponents and returning the treasure back home turned out to be a fun combination. Meanwhile, my younger kid was designing her own game. In fact, we never found a better one later, except for changes to the number and positions of the treasures. We were still experimenting with different card-playing systems, including one where you could either build/modify your program with new cards or run it. Yet, a simple mechanism where you always get a completely new hand of cards after each turn turned out to be more fun. So I picked a game mechanism where you get 5 new cards for each turn and you play 0-5 cards on your turn, discarding the rest.I also decided that all players' cards should be visible. This gives you the opportunity to take others' cards into account when planning your strategy. You might think that having all cards visible would make the game simpler or more predictable but it's in fact the other way around: strategic players have much more variables to take into account. Yet, it gets easier for young children, because the older ones can easily advise them when the cards are in the open. After about 1 month of active game design and dozens and dozens of iterations I finally had the feeling that we have a fun and simple game. I had the first set of game rules written down. I had simplified the game as much as possible, to make the rules easy to learn even for small kids. After signing a publishing deal (!) it took us a couple of months to finalize the game rules. This involved many rounds of testing with different groups of people, involving relatives and colleagues and their respective children. Minor modifications to the rules were tried and improvements were made. It also took some time to decide on the final game theme and the name. The tanks were ruled out pretty quick. We wanted to emphasize coding to some extent but still primarily make the game feel exciting and fun. It should be cool for both girls and boys. It should be easily applied to different languages and cultures. We finally landed on colorful and playful robots landing on a distant planet, in search of colorful diamonds. Then, like a frog turning to a prince, the cardboard monstrosity turned into something beautiful. I was blown away by the first graphic designs made by Mikko Hiltunen for the game. I haven't got those at hand right now, but here's the pretty much final box design. So now we had a working but ugly game and beautiful game asset designs on the computer. You can imagine it felt like a lifetime to wait for the ready products to be shipped. And that it was amazing to finally lay our hands on the finished product. And it was super! To me it looked even better than I had hoped for. 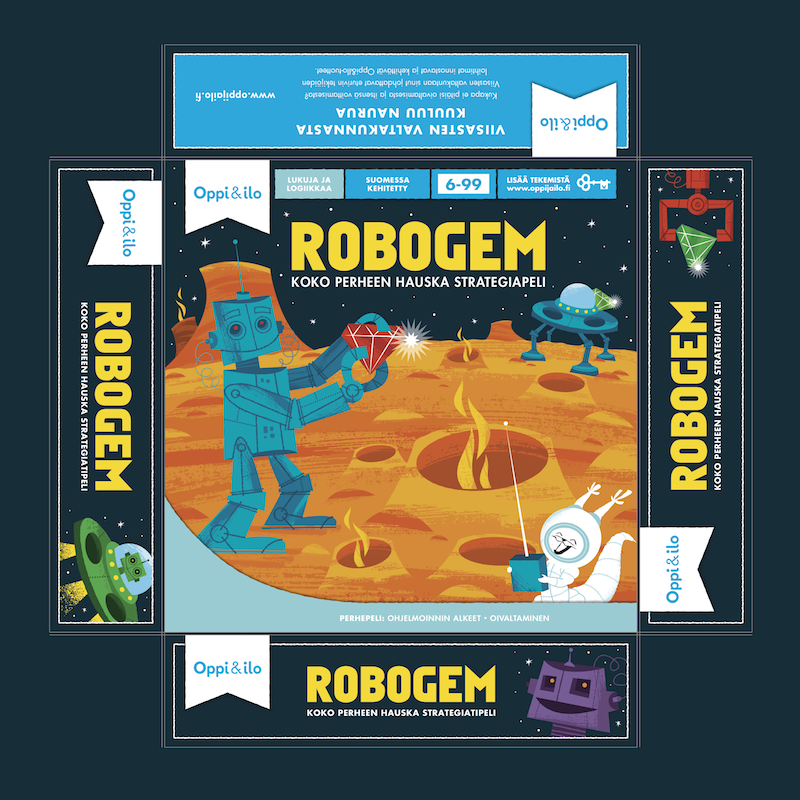 And the game assets (robots, diamonds and the board) are good quality and nice to use. The diamonds fit the slots on top of the robots and everything feels solid. And now the game is available both online and in many Finnish stores! 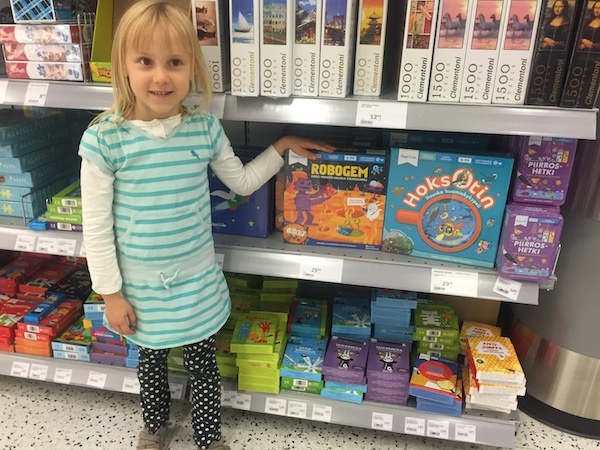 It was pretty cool to see our game in the local supermarket. Please have a look at the gameplay video and the rulebook online! You can buy the game and have it shipped to Europe and the U.S at least, for a reasonable cost. We are still looking for distrubutors worldwide, to have Robogem in the board game boutiques, supermarkets and bookstores all around the world.